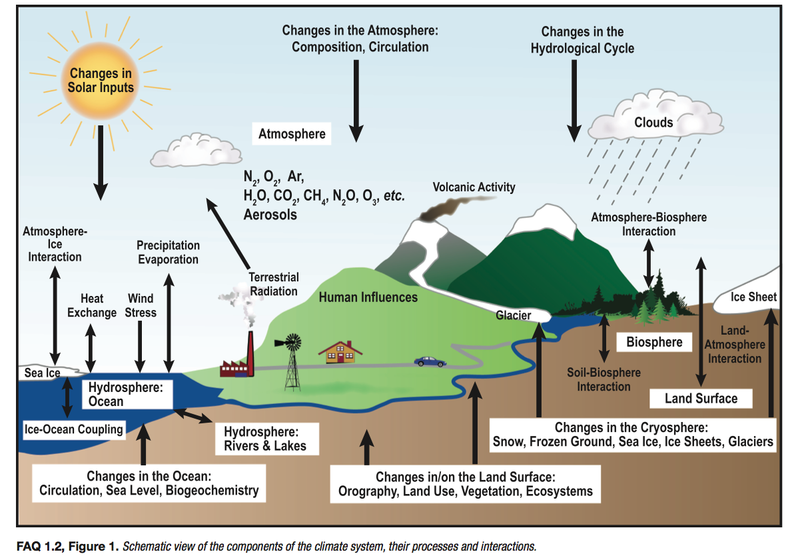 Signs of Climate Change; Portents of Disaster | John J. Berger, Ph.D.
Posted on August 27, 2013 by John J. Berger, Ph.D.
© Copyright 2014 John J. Berger. All Rights Reserved. Because average global temperatures are greatly exceeded at high latitudes and in continental interiors, some temperate forest regions can get extraordinarily hot and dry even at relatively low average global temperature increases, as in the huge Rim Fire now burning within and around Yosemite National Park illustrates. It is one of the largest wildfires in California’s history and is currently considered the most important wildfire in the country. 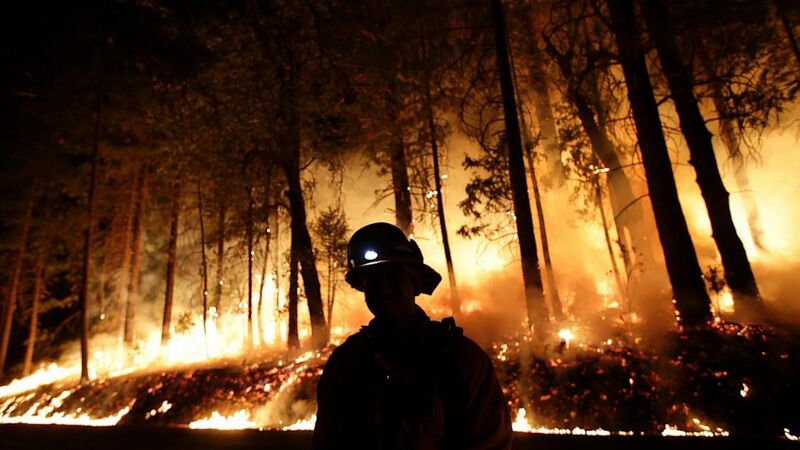 Average minimum temperatures in parts of the central Sierra where the park is located have risen 5.4° F in the past 100 years and this may well be contributing to the increased occurrence of large, very hot, and difficult-to-contain wildfires in parts of the U.S.
A firefighter watches for spot fires during a burnout operation while battling the Rim Fire near Yosemite National Park, Calif., on Sunday, Aug. 25, 2013. “Along with its worst drought in 130-years in 2002, India had a heat wave in May 2002 that killed more than 1,000 people. The temperature reached nearly 124˚F in one village of Andhra Pradesh where a local official reported that birds fell dead out of the trees from the heat. * Tropical Diseases. Lethal insect-borne and waterborne illnesses formerly restricted to the tropics are now spreading to large regions previously free of them. South Africa, for example, virtually malaria-free in the early 1970s, has nearly 60,000 cases a year. Malaria has also reached highland regions of Kenya and Tanzania where it was previously unknown. * Melting Glaciers, and Ice Sheets. Scientists are observing that the Greenland Ice Cap and the West Antarctic ice sheet are melting at an accelerating rate—faster than climate models have predicted. Glaciers in the Himalayas, the world’s largest mass of ice outside the polar regions, are receding faster than anywhere else in the world. They are the source of many important rivers, including the Indus and Ganges. The loss of high-altitude glaciers and diminishing snow packs is already starting to bring more frequent droughts and threaten the water supplies of more than two billion people who already live in in parts of India, Nepal, China, and Pakistan and other regions of water scarcity. The East Asian monsoon has also been unreliable over the past 30 years, reducing rainfall in parts of China. * Sea Level Rise. Sea level rises on a warming Earth because of ice and snow melt, and due to the expansion of warming sea water. Significant sea level rise has occurred—about 8 inches in the past century—a much faster rate than forecast. As seas rise, parts of heavily populated, low-lying coastal regions and major cities around the world will be below sea level. In the U.S., parts of coastal cities like Boston, New York, Baltimore, and Washington D.C., will be flooded as well as large parts of Florida, Louisiana, and elsewhere. Using Google Earth, anyone with a personal computer can now see what these cities will look like at various expected sea levels. * Sea Ice Melting. Highly reflective summer sea ice in the Arctic is disappearing. As this highly reflective ice vanishes, it is replaced by darker-colored water that absorbs vastly more of the sun’s heat and acts as another very strong positive feedback that contributes to global warming and climate change. * Melting Permafrost and Frozen Methane. Permafrost in northern latitudes and frozen methane deposits in the ocean known as clathrates together those contain trillions of tons of stored carbon. The permafrost and clathrates both have slowly begun to thaw and release methane and carbon dioxide to the atmosphere. The more permafrost and clathrates melt, the hotter the earth becomes, and so the more melting occurs. If continued, at some point, the melting of these vast stocks of carbon would transform the climate beyond recognition and lead to a “runaway” greenhouse effect, transforming the earth into an ice-free planet as it was millions of years ago. (Methane is 72 times more powerful a greenhouse gas than carbon dioxide on a per molecule basis over a 20-year period.) According to the geological record, when Earth was ice-free, sea level was about 250 feet higher than at the present. * Extinctions. Plant and animal extinctions are accelerating on land and in the sea. The Amazon tropical rain forest is already beginning to suffer from repeated severe droughts and increased tree mortality. Millions of acres of the forest were devastated in 2010; other severe droughts preceded it in 2007 and 2005. If unchecked, this will destroy the rainforest ecosystem with disastrous consequences for global climate, wildlife, and humanity. ) * HarmfulOcean Changes. Vast harmful oceanic changes (temperature increases, acidification, coral reef death, low-oxygen zones) are already occurring. Coral reef bleaching, a sign of severe and potentially fatal stress caused by ocean warming and other factors, is evident in oceans of the world. Half the reefs of the Indian Ocean and around South Asia have already lost most of their living coral, and current trends suggest that 95 percent of the reefs will be dead by 2050 if this pace continues. The drastic climate changes that have already occurred after only 1.4° F—less than 1° C—of warming show the climate system has already been gravely destabilized. This indicates that greatly amplified additional warming and disastrous consequences are likely should warming continue unabated.” © Copyright 2013 John J. Berger. All RIghts Reserved. This entry was posted in Climate, Forests and tagged climate catastrophe, coral reef bleaching, extinctions, global temperature increase, global warming effects, heat waves, impacts of climate change, melting glaciers, melting permafrost, panel on climate change, tropical diseases, wildfires. Bookmark the permalink.